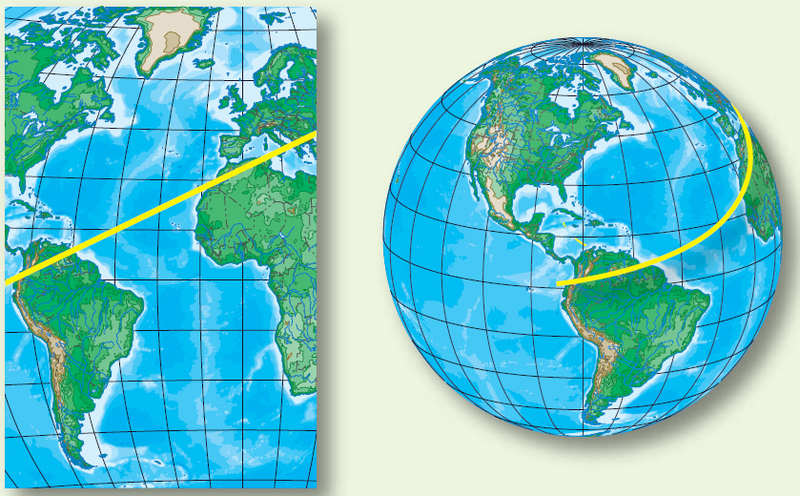 The latitude of a point can be shown as 20° N or 20° S of the equator, but there is no way of knowing whether one point is east or west of another. This difficulty is resolved by use of the other component of the coordinate system, longitude, which is the measurement of this east-west distance. Longitude, unlike latitude, has no natural starting point for numbering. The solution has been to select an arbitrary starting point. A great many places have been used, but when the Englishspeaking people began to make charts, they chose the meridian through their principal observatory in Greenwich, England, as the origin for counting longitude. This Greenwich meridian is sometimes called the prime meridian, though actually it is the zero meridian. Longitude is counted east and west from this meridian through 180°. 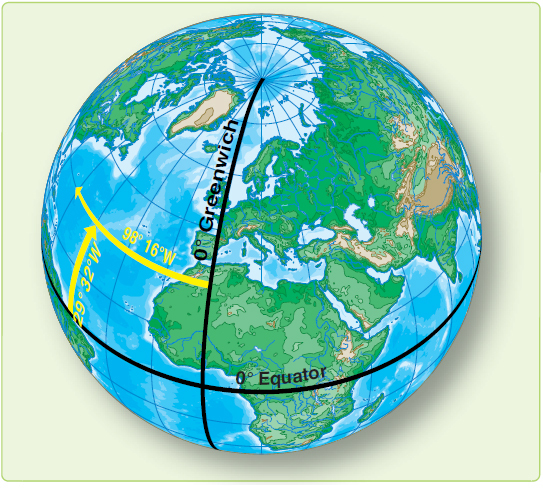 [Figure 1-5] Thus, the Greenwich meridian is the 0° longitude on one side of the earth and, after crossing the poles, it becomes the 180th meridian (180° east or west of the 0° meridian). Figure 1-5. Longitude is measured east and west of the Greenwich Meridian. Figure 1-6. Latitude is measured from the equator; longitude from the prime meridian. It is beneficial to point out here some of the measurements used in the coordinate system. Latitude is measured in degrees up to 90, and longitude is expressed in degrees up to 180. The total number of degrees in any one circle is always 360. A degree (°) of arc may be subdivided into smaller units by dividing each degree into 60 minutes (‘) of arc. Each minute may be further subdivided into 60 seconds (“) of arc. Measurement may also be expressed in degrees, minutes, and tenths of minutes. In actual practice, map production requires surveyors to measure the latitude and longitude of geographic objects in their area of interest. Local variation in the earth’s gravity field can cause these measurements to be inconsistent. All coordinates from maps, charts, traditional surveys, and satellite positioning systems are tied to an individual mathematical model of the earth called a datum. Coordinates for a given point may differ between datums by hundreds of yards. In other words, latitude and longitude measured directly from observation of stars (called an astronomic coordinate) is consistent, but it may not match maps, charts, or surveyed points. The theoretical consistency of latitude and longitude is therefore not achievable in reality. Without knowledge of the datum used to establish a particular map or surveyed coordinate, the coordinate is suspect at best. Closely related to the concept of distance is speed, which determines the rate of change of position. Speed is usually expressed in miles per hour (mph), this being either SM per hour or NM per hour. If the measure of distance is NM, it is customary to speak of speed in terms of knots. Thus, a speed of 200 knots and a speed of 200 NM per hour are the same thing. It is incorrect to say 200 knots per hour unless referring to acceleration. Remember, direction is the position of one point in space relative to another without reference to the distance between them. The time honored point system for specifying a direction as north, north-northwest, northwest, westnorthwest, west, etc., is not adequate for modern navigation. It has been replaced for most purposes by a numerical system. 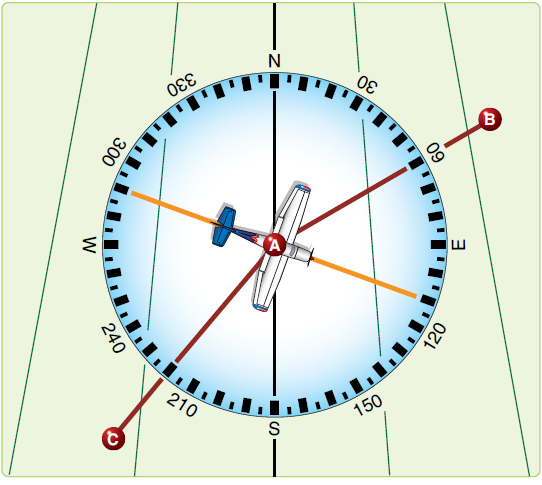 [Figure 1-7] The numerical system divides the horizon into 360°, starting with north as 000° and continuing clockwise through east 090°, south 180°, west 270°, and back to north. Figure 1-7. Numerical system is used in air navigation. The circle, called a compass rose, represents the horizon divided into 360°. The nearly vertical lines in Figure 1-7 are meridians drawn as straight lines with the meridian of position A passing through 000° and 180° of the compass rose. Position B lies at a true direction of 062° from A, and position C is at a true direction of 220° from A. Since determination of direction is one of the most important parts of the navigator’s work, the various terms involved should be clearly understood. Generally, in navigation, unless otherwise stated, directions are called true directions. Course is the intended horizontal direction of travel. 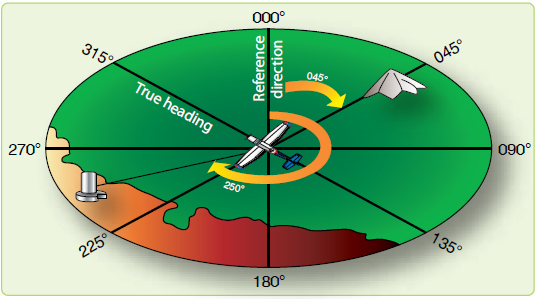 Heading is the horizontal direction in which an aircraft is pointed. 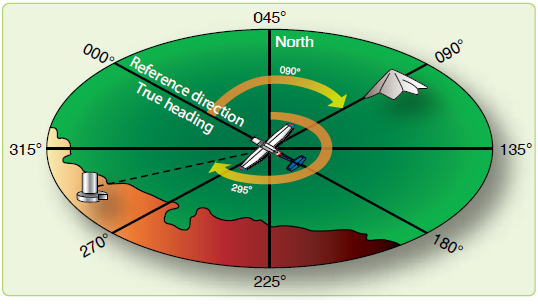 Heading is the actual orientation of the longitudinal axis of the aircraft at any instant, while course is the direction intended to be made good. Track is the actual horizontal direction made by the aircraft over the earth. Figure 1-8. Measuring true bearing from true north. Figure 1-9. Measuring relative bearing from aircraft heading. 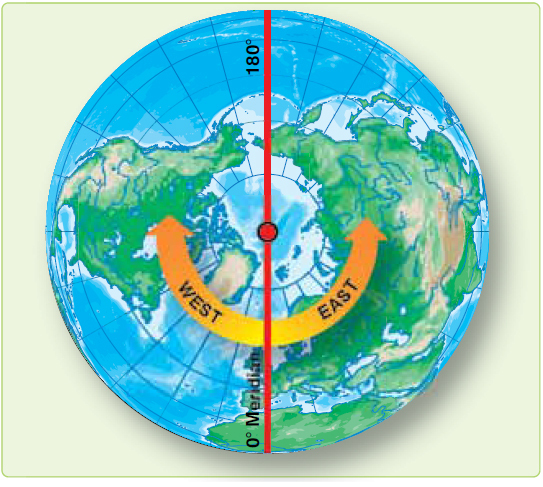 The direction of the great circle, shown in Figure 1-10, makes an angle of about 40° with the meridian near Washington, D.C., about 85° with the meridian near Iceland, and a still greater angle with the meridian near Moscow. In other words, the direction of the great circle is constantly changing as progress is made along the route and is different at every point along the great circle. Flying such a route requires constant change of direction and would be difficult to fly under ordinary conditions. Still, it is the most desirable route because it is the shortest distance between any two points. Figure 1-11. A rhumb line or loxodrome. Between two points on the earth, the great circle is shorter than the rhumb line, but the difference is negligible for short distances (except in high latitudes) or if the line approximates a meridian or the equator.